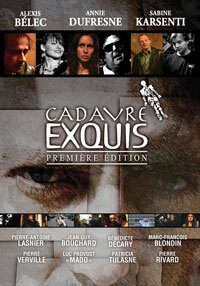 Cover for the film Cadavre Exquis premiere edition. From an Original Idea by Adrien Lorion, David Etienne and Michel Laroche, the eleven directors of Cadavre Exquis premiere edition are each making their debut in features. The film is a collective project based on the principle of the Exquisite corpse parlour game. Roxy, a glam-rock star past his prime who has just made a pact with the Devil, goes through much emotional gear shifting when a dozen different writers and directors take control of his destiny and rewrite his life story as they see fit. In his predestined life, Roxy meets a wide variety of colourful characters: women he once loved but has trouble recognizing today; a crooked dealer who keeps leading him astray; a drag queen on the rebound; a failed playwright; a woman barkeep who's interested in Roxy; and, of course, Mephistopheles in all his disguises. The Original Soundtrack of Cadavre Exquis premiere edition movie. This page was last modified on 14 July 2016, at 09:57.